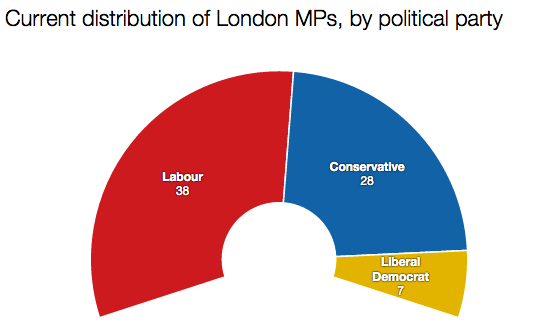 Ever since Labour did better than expected in London in last year’s local elections, there’s been a sense that come the general election the party will benefit from a higher swing in the capital than elsewhere. A poll in the Guardian a few days ago suggests this remains the case, with Labour on course for around eight gains. There’s a chance it could go further and make up to 11 gains, however. I’ve given Labour eight gains, which would be line with the Guardian’s poll and possibly what the party is realistically hoping to achieve. Six come from the Conservatives: Hendon, Enfield North, Brentford & Isleworth (where David Cameron popped up on Friday for the first of many photo opportunities in marginal seats), Croydon Central, Harrow East and Ealing Central & Acton. Two come from the Liberal Democrats: Brent Central and Hornsey & Wood Green. Labour are up 11: the eight seats mentioned above, plus two more from the Tories (Ilford North and Finchley & Golders Green) and one from the Liberal Democrats (Bermondsey & Old Southwark). 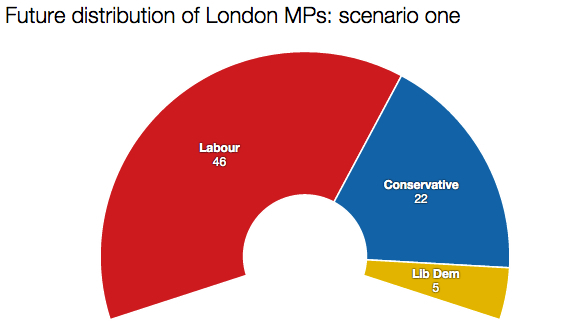 But this scenario also involves the Tories compounding the Lib Dems’ malady by taking Sutton & Cheam and Carshalton & Wallington, leaving Nick Clegg’s party with just two seats in the whole of London. Such an outcome feels unlikely at the moment, though it’s not impossible. I’ve long thought Paul Burstow will hold Sutton & Cheam for the Lib Dems, despite his majority of just 1,608. 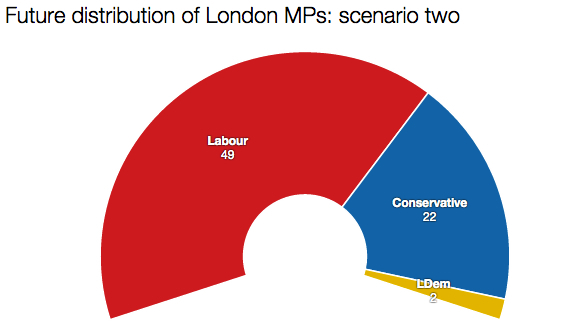 But I also suspect Labour is in with a shot at Ilford North. Finchley & Golders Green is perhaps a step too far, but anecdotal evidence – I live in the constituency – suggests Labour is winning the war of the leaflets and door-to-door visits. Whatever happens, I sense the swings we’ll see in London (Harrow East would fall on 3.6%, for example) will be higher than elsewhere in the country – and certainly higher than elsewhere in south-east England.